On his debut release, Voltaire satirized the concept of Evil and the many ways it manifests itself in the world. Now, two years later, Voltaire returns with a more lighthearted look at life from the perspective of God’s angelic cast-off, Lucifer, driven by pride to attempt the first failed coup in history. Singing in a deep, velvety croon with all the passion, sorrow and bitterness of a fallen angel, Voltaire has crafted an album full of haunting Old World melodies and memorable pop tunes that you won’t be able to get out of your head without a guillotine. Always the devilish wordsmith, Voltaire’s songs dance between the sardonic, the heartfelt and the absurd. Whether he is singing about a lost love or a public beheading, Voltaire effervesces in a playfully boisterous mix of wit and old-fashioned merriment. Spontaneously full of mirth and dark humor, Almost Human blurs the gap between the 18th and 21st centuries. This is pop music for a parallel universe, where Morrissey is the Queen of England and electricity was never discovered. Cleverly combining classical instruments with present-day song structures, Voltaire’s New Wave band from the Victorian Era cavort through a cabaret suitable for the most contemporary of dance floors. “God thinks you’re an idiot.” So sings Voltaire. Voltaire comes off a bit heavy, but luckily he doesn’t seem to take himself as seriously as you would think. Voltaire’s voice reminds a bit of Morrissey (The Smiths). Almost Human is sung from the viewpoint of Lucifer and is strong on clever lyrics. 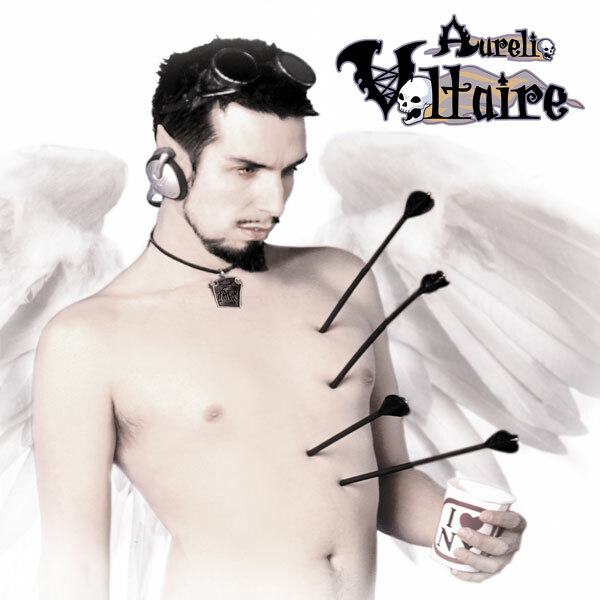 Voltaire’s goth-pop isn’t run of the mill either, featuring a violin as a lead instrument. Admittedly I wasn’t expecting much from this one but the irreverence of “God Thinks” hooked me. Also of note are “Dead Girls” (“Have you ever loved someone who didn’t hurt you…There’s no shame, there’s no pulse!”), and the cute lyrics of “Alchemy Mondays,” in which we catch Lucifer after another night of partying. Hip gothic cleverness you might enjoy. Succeeding the spectacular The Devil’s Bris is Voltaire’s sophomore effort, Almost Human. As do all sophomore releases, Almost human has the inevitable factor of having to live up to a debut album. Well, is it better than The Devil’s Bris?? . . . . HELL YES!!!!!!! This is the singular most catchy and amusing album I have listened to in a long time. Voltaire finally has established his own sound. Shying away from the slightly more depressing sound of The Devil’s Bris, Voltaire is now walking a fine line between Gothic Folk and nineties Pop, giving the music a very upbeat and vibrant feel. I bought this album around the time of its release and I must say that the replay value is most high. I believe Voltaire would appeal to anyone regardless of what genres they like. Voltaire is indeed music for all occasions. As always, Voltaire’s lyrical bravado is his focal point. Lyrically, the majority of the songs are written from the perspective of Lucifer, God’s fallen castaway. Voltaire sings with the passion and expression that one would normally expect from a fallen angel. If I ever stumble upon dark times, I can be sure that Almost Human will be there to put a smile on my face. I can say no more, just buy it. You will not be disappointed. In 1998, the music world was introduced to Voltaire’s sardonic verbal barrages on The Devil’s Bris. The album was unlike anything I’d encountered before. It was comprised of classical instrumentation, folk and celtic stylings all filtered through Voltaire’s tragi-comic gothic (in)-sensibilities. Who else could title their album Devil’s Circumcision (Bris) with all the aplomb and glee of Wednesday’s child? Almost Human is the evil twin of The Devil’s Bris. It distinguishes itself from that excellent album by its still more wicked sense of humor. It has a fuller, more expansive sound than its predecessor. The instrumentation is still familiar, and it’s used to great effect as it emphasises and punctuates the witty observations of this earthbound seraph. “God Thinks” is far and above my favorite track on this album. The song is pointed, uncompromising, and spares no one who misappropriates “god” for their own ends. Anyone who has been appalled by such offenses, will revel in the delivery of this indictment all set to rollicking instrumentation. “Never trust a man who puts his words in the mouth of God and says it’s absolute truth,” if this isn’t the the barometer of truth, nothing is. “Dead Girls” is the story of a fellow unlucky in love, until he found it with women in the morgue. These are women who accept him unconditionally. Well, as discouraging as women can be to a man’s aspirations, we must not judge the poor wretch to harshly. ” Have you ever loved someone, who didn’t hurt you, harm you? There’s no pain and there’s no pressure. No verbal humiliation, there’s no fear, there’s no shame.” This story might serve as a macabre allegory to the plight of more timid, and yet no less passionate souls. Did I mention it is extraordinarily funny as well? “Feathery Wings” is the sorrowful and sanguine entreaty of an empathetic spirit seeking redemption. It cannot know the release of death, it’s only hope is forgiveness. The vocal delivery on this particular track is particularly affecting. This was my second favorite track of the album. It was beautifully rendered by a master of humor filtered through pain. Bravo maestro. The dark angel is back!! After getting us out of depression with The Devil’s Bris, Voltaire comes back with a new album, which should get us on the way to remission! As always, Voltaire is faithful to his dark folk, dark humor style, and yes, I love it! On this record, the violins, guitar and sarcastic humor brilliantly intertwine with each other. The native New Yorker (with the accent!) has returned to once again bewitch us (like Samantha! ), job well accomplished. Now, Voltaire is a brilliant animator, a great musician/songwriter, and to top it a a cutie! What eeeeelse!!! Get that CD! One of those, “if you like Marc Almond, you’ll love this guy!” Even more on the mark (Almond-wise) than this year’s other contender Jack Lukeman. Voltaire takes a positively Goth subject matter approach, but the music and feel of the songs are decidedly cabaret (goth cabaret?). He mixes it up with plenty of strings(the solo kind, not much in the way of beds) and horns, etc. Not exactly lighthearted, the album does have a great sense of humor (“Dead Girls” and “Headless Waltz”). A very enjoyable album, fresh sounding without being too weird. Don’t let the cover scare you off. Highly recommended. Sometimes, evil indeed has a name. Fans of Voltaire’s The Devil’s Bris released in 1998 by Projekt, will be tickled pink by the singer/songwriter/artist’s newest incantation of mischief, Almost Human. Where The Devil’s Bris harks back to the days of old with its Victorian-esque rhythms, Almost Human adds a quick paced beat sure to get your toes tapping for the 21st century. Warning, this album is NOT for people without a sense of wry humor. Intent on a theme, Voltaire spins lyrics into a panoramic masterpiece of one of the best known Evil Incarnates, Lucifer Morningstar himself. From such catchy tunes as “Out of Reach” (sure to be as popular as “When You’re Evil”) to the remorseful ballad of “Feathery Wings” to the controversial song “God Thinks,” Voltaire once again paints a picture of pure chaos in the midst of a sane world. Of course, there is nothing sane about the furious concerto constructed by Kitzis and Goeke’s mixture of violin and cello, accompanied by Alexiev’s drums, to add a sleek resonance to Voltaire’s crooning utterances of a fallen angel cast down to spend eternity on Earth. I actually had the pleasure of meeting Voltaire, and indeed, he is not the type of person you just take home to meet your mother (though he is extremely charming). His live shows are to “die” for, full of wit and satire as he improvises to make each show unique and a pleasurable experience. Almost Human is a worthy investment, so break open those piggy banks, shake out those “darkity dark” clothing, and get ready to be transformed to a world where Evil smiles winningly at your doorstep. With overjoyed evil, Voltaire’s first release, The Devil’s Bris, made wonderful fun out of the darker side of the human psyche, love, and the everyday world, giving us the now-classic “When You’re Evil,” “Ex-Lover’s Lover” and “The Man Upstairs,” amongst other bits of wonder. Mixing old-world musicianship with modern dark-pop sensibilities, Voltaire made quite an impact. His second, and newest, release Almost Human, takes the achievements of The Devil’s Bris and improves them immensely. What makes Voltaire so wonderful is his devilish wit and a brilliant musical vision. Mixing up violins, acoustic guitars, drums and a myriad of other “classic” instruments, The Devil’s Bris was pure impish cleverness and dark-darkity-dark-dark delight. Almost Human “updates” that sound a bit, adding in bass guitar, giving a deeper end and addictive groove to his European folklore-ish minstrelsy. The music would be enjoyable enough without the ghoulish jester’s crooning lyrics; the sinister romp of “Anastasia,” the gypsy swirl of “The Night” and the skeletal ballroom number, “The Headless Waltz,” would all be remarkable pieces of music even if Voltaire never opened his mouth. Fortunately, he does (though he’d have you think otherwise, if “Dunce” is to be believed!). Voltaire is sarcastic, scathing, mocking, ironic, clever and stunningly poetic. The aforementioned “Dunce” is a glorious ode to putting one’s foot in one’s mouth; about saying the completely wrong thing at the completely wrong time. “All hail the king of dunces, best hold on I’m opening up my mouth” he pleads in the chorus while “Smear my lips with Vaseline, I’m a vocal libertine; I’d try explaining but even then I’m not quite sure what I meant” points to the wit maintained through the song. Almost Human is a brilliantly misanthropic look at the human race; “Pity me, I’m almost a human being” he says, having taken on the role of a fallen angel, which is the central theme to the album. It’s likely safe to say that anyone listening to Voltaire will find much to delight in with “God Thinks,” a song about how people “using His name for your own protection” are hateful wastes of flesh, while instructing “Never trust a man who puts his words in the mouth of God and says it’s absolute truth”. Necrophilia forms the basis of the catchy “Dead Girls” (“there’s no pain, and there’s no pressure, no verbal humiliation; there’s no fear, there’s no shame, there’s no pulse! So is it so strange? ), and the infamous Guillotine gives the rousing “Headless Waltz” (“What a shame, I’ve forgotten my name, without the use of my brain and My, bet I’ll sleep well tonight! Without this head of mine”). Voltaire has also written what is likely the first goth song to feature the term “pee pee” with “Alchemy Mondays,” an in-joke of sorts about a New York goth club (or rather deepest darkest Hell). He also pulls some linguistic gymnastics, including a song in Japanese (“Ringo No Uta,” which seems to be a traditional love song) and the Spanish “El Barquito De Nuez.” Musically, Voltaire describes Almost Human as sounding like a New Wave band stuck in the Victorian era, and that’s as fair an assessment as any. Hook-laden mid-80’s pop played out on acoustic guitars, violin, drum and bass, the strangely out-of-place sound is a perfect backdrop to the bewildered genius of his lyrics. Sort of like Morrissey, given a string quartet & cross bred with a bitter gothy version of Weird Al Yankovich (right down to the polka). While lacking the same catchy super-singles as his first album (The Devil’s Bris), Voltaire’s Almost Human is still a wonderful romp through Necrophilia, Heresy and Mental Illness – with a few traditional folk type songs thrown in for good measure. The music is a mix of brooding violins, cello, acoustic guitars and light percussion, with Voltaire’s velvety voice singing tales of lament, love and lunacy. Because of the structure of the music many of the songs bear uncanny resemblances as far as instrumentation is concerned to tracks on the first album, but the distinct and incredibly infectious lyrics are really what sets this album apart. Unlike the first album, which dealt with the nature of evil, and crazy neighbours, Almost Human has a more serious tone overall but still presented in a very jovial manner. Several tracks even focus on religion, a subject usually left untouched by artists in fear of social repercussions – from “Almost Human” which is sung from the point of view of a particularly notorious fallen angel, to “God thinks” which pokes at those who claim to know what god “truly wants”. Other tracks are flat out bizarre, including a advertising jingle for a Club Night in Voltaire’s hometown of New York City (“Alchemy Mondays”) and of course “Dead Girls”, which relates one man’s experiences with, well, dead girls. The album has a wonderful, bouncy, tongue in cheek attitude and sometimes is just so bizarre that it’ll make you laugh aloud – even after the second or third listen. Overall, a wonderfully crafted and thoroughly entertaining release for anyone who doesn’t mind a bit of humour in their music.